If you’re looking for keepsake Christmas craft ideas you have come to the right place! 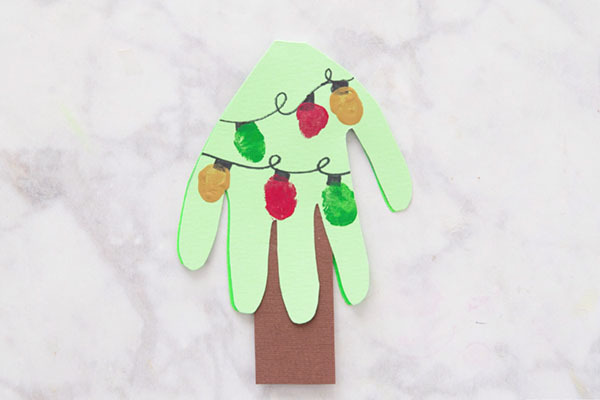 We have already shared one Handprint Christmas Card idea – this adorable Santa Handprint Card. 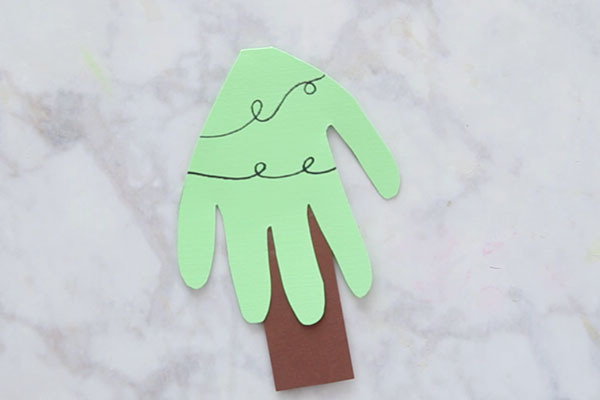 Today we’re going to show you how to make this Fingerprint Christmas Tree. 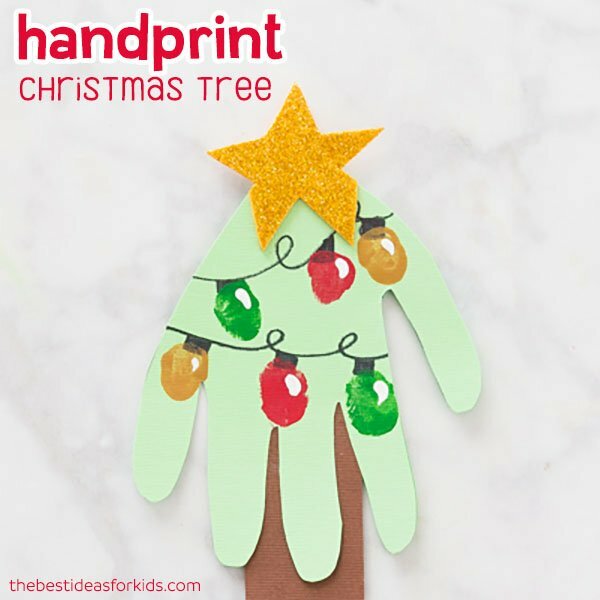 And if you’re looking for a larger Handprint Christmas Tree to make with your family or students be sure to see this handprint Christmas tree. 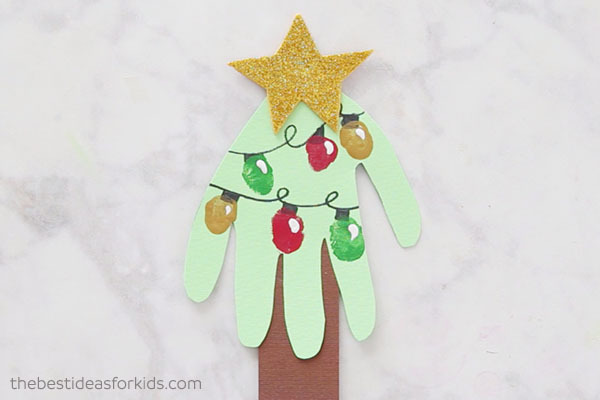 If you love handprint crafts be sure to check back often for more fun Christmas handprint crafts! We have a few more planned this year. And don’t forget to see our 3D handprint christmas tree and santa handprint craft. 1. 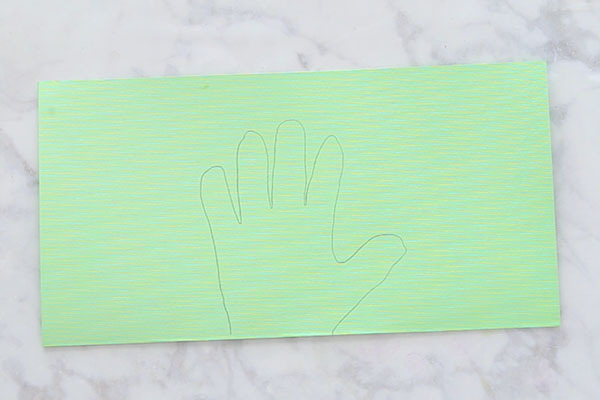 First fold your green cardstock in half and trace your hand so that the wrist is on the folded part. 2. 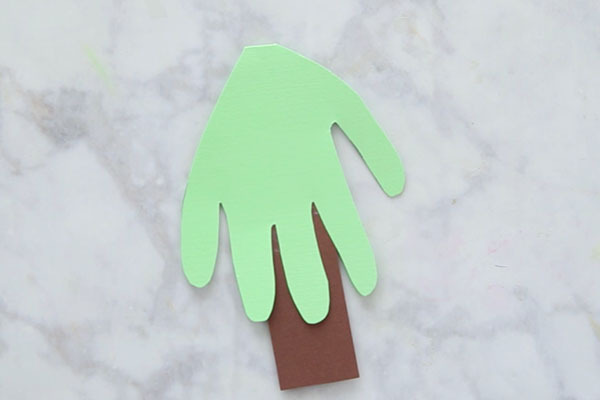 Cut out your handprint and cut the top tapered in so that it looks like the top of a Christmas tree. 3. Add your trunk of the Christmas tree by cutting out a rectangle shape from your brown paper. Glue to the top of your card so that when it opens up the bottom has more space for writing. 4. Draw on your Christmas tree light strings with black sharpie by making two swirls. Be sure to space these out enough so that you can fit your fingerprint christmas lights on them. 5. Add 3 spots on each string of lights for where your fingerprints will go with your black sharpie. Then using green, red and gold paint make your fingerprints! 6. Add a little bit of white paint on top of your fingerprints to give the light bulbs a more realistic look. 7. Now cut out a large star from your gold foam paper and glue to the top of your Christmas tree. 8. Finally, write your message inside! You can also write a poem inside too. Wouldn’t this look great on top of a gift? 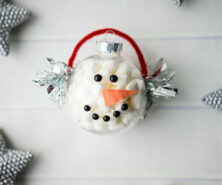 Or even add some string or ribbon and turn it into an ornament! 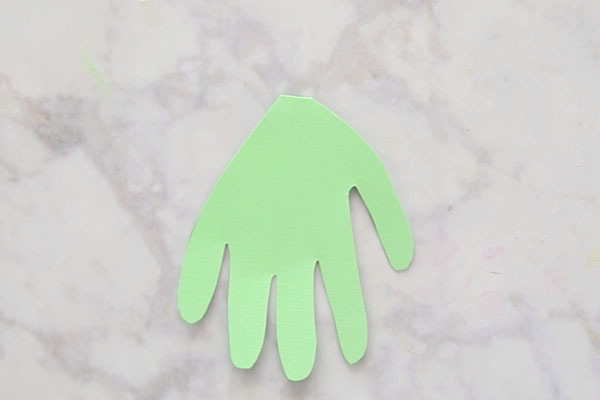 Want more Handprint Christmas Ideas? See these fun Christmas craft ideas! 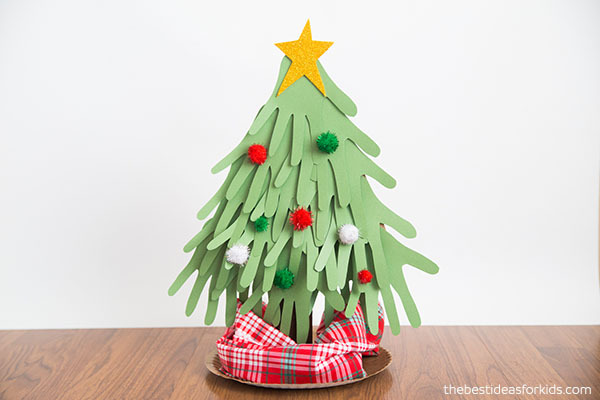 This handprint Christmas Tree would look great as a Christmas centerpiece! 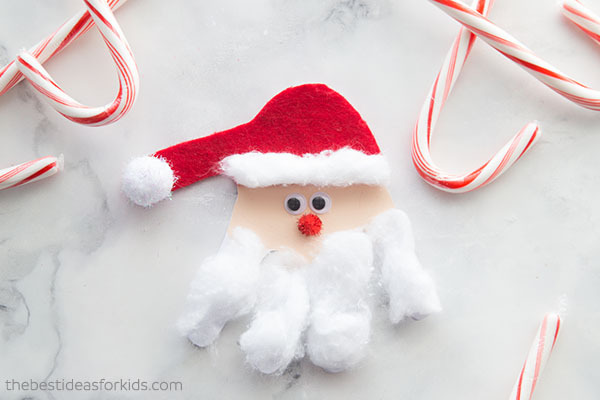 This Santa handprint card would be such a cute keepsake, and you can even turn it into an ornament too! 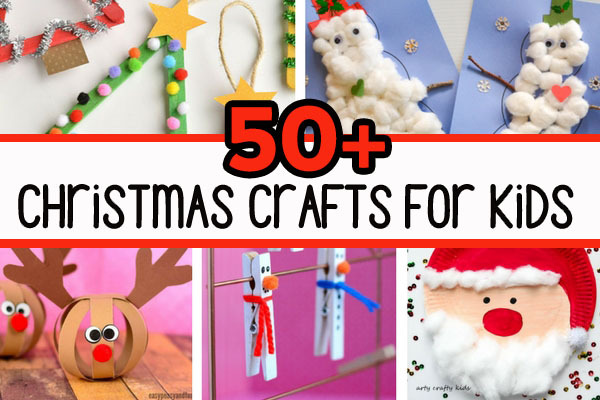 And if you’re looking for more fun Christmas crafts, see over 50+ Christmas crafts for kids.